German Chocolate Brownies ~ Learn, Live, and Explore! I baked these German Chocolate Brownies for my Improv Comedy class tonight because I brought my champagne cupcakes to class two weeks ago and my instructor made the comment that German chocolate cake is his weakness. Which got me thinking about how to make a something in German chocolate miniature. Since I had already done the cupcake thing for class, and making a full blown cake was out of the question, I started searching around Pinterest for ideas. The result is a combination of two brownie recipes. 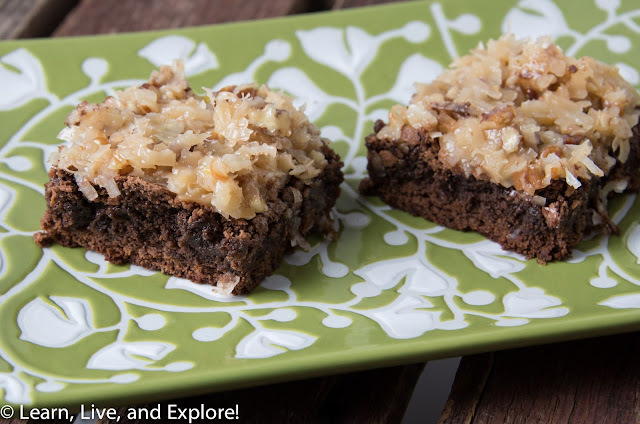 The funny thing about German chocolate cake is that, contrary to popular belief, it does not originate from Germany. It is actually an American cake that uses a sweet dark baking chocolate formulated by Sam German for the Baker's Chocolate Company in 1852. And the name of the cake was originally German's Chocolate Cake, obviously. Who knows where the apostrophe and "s" went over the years! The recipe for the brownies below is an adaptation from this website and the frosting is an adaptation from My Baking Addiction. In a large saucepan combine evaporated milk, sugar, egg yolk and butter. Cook over low heat, stirring constantly, until thickened, about 5-7 minutes. Remove from heat and stir in vanilla, pecans, and coconut. Spread on brownies while still warm.